All the Essential Components of a Licensing Program Infused with Experience, Dedication, and Creativity. The Wildflower Group offers comprehensive licensing services and expertise that leverage its clients’ brands through new products and markets, building sales and revenue, and increasing brand equity and awareness. The Wildflower Group’s roster of clients includes brands with combined assets in excess of a billion dollars. Creative direction is core to building a consistent, cohesive look for a licensing program and to providing a strong, overall brand statement. Legal sets the framework and structure for a long-term relationship between a licensor and licensee. TWG manages the entire license application process and has negotiated hundreds of license agreements on behalf of its clients. TWG’s legal services include dedicated and experienced in-house expertise combined with an external legal team. In addition, TWG provides comprehensive royalty reporting services. For the life of the licensing program, TWG conducts on-going follow-up and maintains regular communication with the licensees. 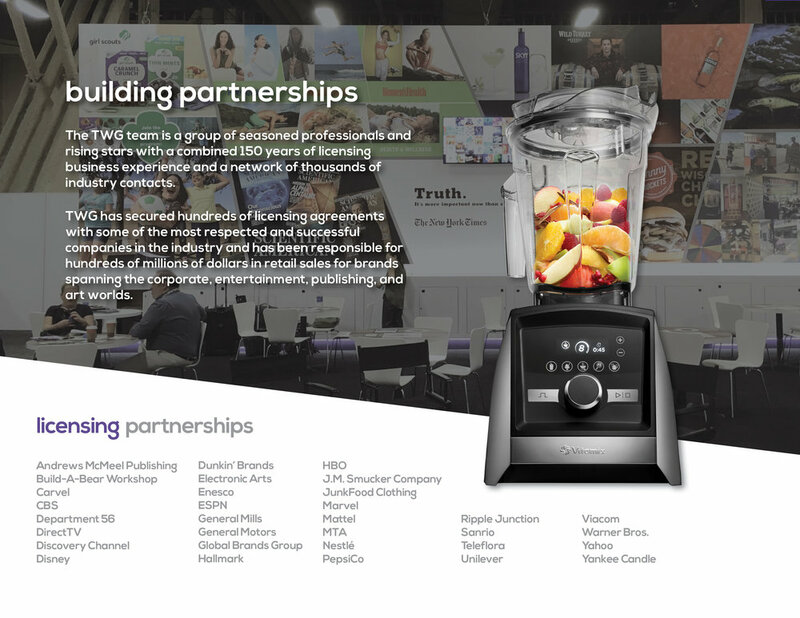 TWG works with licensees to provide support on retail pitches and placement and build synergy between licensed products. Under its twgKonnect division, TWG offers a suite of ecommerce solutions from consulting to store build to management.